Ever wonder how candy was made in the nineteenth century? An 1874 catalog from Thomas Mills & Brother entitled Descriptive and Illustrated Catalogue of Goods advertises a machine which made Candy Toys. It was called the Mills’ Excelsior Toy Machine and was patented on September 1, 1868. The machine cost $500 and had the ability to make 500 to 1000 pounds of candy toys each day. 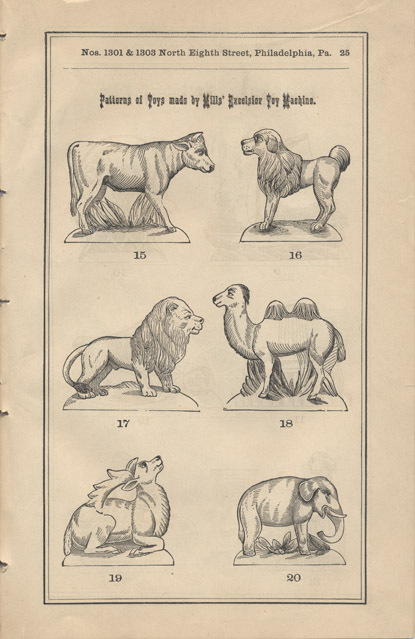 The candy toys could be made in 33 different patterns including a ship, rocking horse, and train as well as a number of animals, such as a dog, lion, camel, or elephant.